Betterfly is the first website of its kind to exclude companies, focusing on people instead, and that gives it a strategic advantage, says founder Joshua Schwadron. "When searching for someone to teach you Spanish, give you a massage or improve your yoga technique, it's more important to know who the best person is, rather than knowing just the name of a language school, spa or yoga studio," Schwadron says. "Imagine if eHarmony.com told you that your future wife worked at Citigroup, but left it up to you to figure out who she is. Now what?" Betterfly is a site that connects service providers with people who want to learn, look, and feel better. It provides a lot of utility for people who teach or offer a service, everything from dating coaches to dance teachers to beauty stylists. Users might be interested in finding a dating coach, particularly one that specializes in online dating. Because the site has over 1,000+ services, there are so many options, and is a great place to set up date night. Who doesn't want to learn from a cooking teacher on how to make a romantic meal for two? Or maybe salsa dancing! Since learning, looking and feeling better often involves finding the right people to help, Betterfly sets out to make that process easier and more efficient for its users and enables users to compare apples to apples, people to people. Users can refine their search based on more than 20 factors such as availability, friends' recommendations, verified reviews and value. "We're thrilled with the power and utility of our search. Most of those features are in place now, and we plan to release the rest when we begin our late-summer campaign to reach out to those on the other side of the equation: the people who want to be better," Schwadron says. The current campaign is Betterfly's way of recognizing that the site needs Betterists™ to sign up and offer services before potential clients can harness the full power of its search tools. A Betterist is a person on Betterfly who offers a service to help someone learn, look or feel better. "There was no one word to refer to teachers, tutors, coaches, trainers, stylists and all the people who help others be better, so we created our own," Schwadron says. There is no approval process or cost to become a Betterist. "We don't want only experts or seasoned professionals on our site, because many of our users aren't looking for only the best — they're looking for the best for them. For example, a 9th grader who struggles with geometry doesn't need to work with a professional mathematician. Her perfect Betterist may be a classmate who got an A+ and charges only $10 an hour." While conducting research for the site, Schwadron and his team found that two groups of Betterists each face a unique set of challenges that Betterfly can help solve. The first group, made up of people who work for companies, feels powerless to help themselves and their companies bring in business; they rely solely on their companies for new clients. The other group, people who are self-employed, continually tries to promote and re-promote their services across numerous websites, each supposed to serve a different purpose. Betterfly's free platform is built to give all types of Betterists the tools they need to brand and promote themselves quickly and efficiently, all in one place. Each Betterist can create a free, highly customizable page that Schwadron says is "like a mini-website that can be made in minutes." Betterists can promote their qualifications, services, locations, special offers and payment policies, upload resources like instructional videos and lesson plans and even create their own blogs. Their pages display verified reviews from clients and have a real-time booking system to easily promote their availability and latest discounts. The availability calendar helps Betterists manage existing clients and attract new ones. Potential clients can even search by available time for a lesson or appointment in the same way that people can search Opentable.com for a dinner reservation at a particular time, without having a restaurant in mind. Furthermore, Betterfly is unique because all reviews are verified. Only those people whom Betterists have verified as clients can write reviews. Once verified, the client may review anonymously or under his or her own name. "Many sites are plagued by false reviews and character assassinations. On Betterfly, every review you read is from a client the Betterist has personally verified, even the anonymous ones," Schwadron explains. Betterfly has already attracted a wide range of Betterists who joined during the site's testing phase. Betterists include Christy McIntosh, an actress who has appeared in Law & Order: SVU and who offers acting lessons; Svetlana Vinogradova, a hair stylist who works for the Jean-Claude Biguine Salon in NYC and offers men's haircuts; Simon Boyar, a world-renowned marimba player who gives lessons between gigs; and Joanne Summer, a grandmother of eight who offers healthy home-cooking lessons on the weekends. 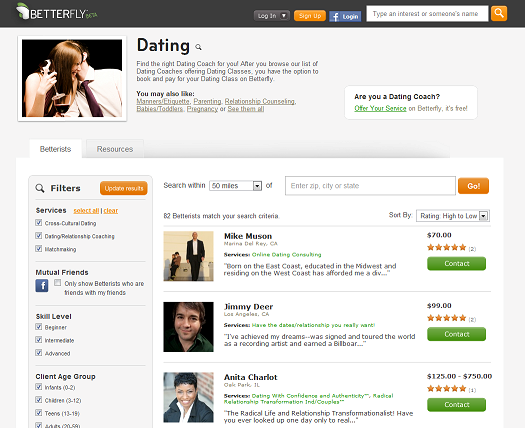 Founded in 2009 by Joshua Schwadron, 28, Beterfly is based in New York, NY. For more information, visit http://betterfly.com.